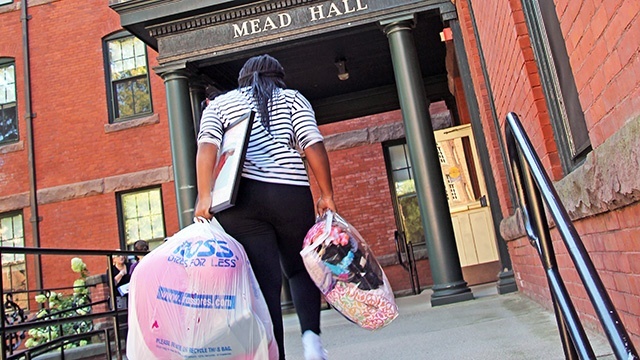 Move-in day 2016: it’s your move! The energy? Raw and electric. The bags? Packed—and repacked—with care. The scene? Equal parts meet-and-greet and homecoming. MoHome? It comes alive as students from the classes of 2017–2020 converge on campus. Watch the video to see Acting President Sonya Stephens and Vice President for Student Life and Dean of Students Marcella Runell Hall out in the thick of it—bearing witness to the arrivals, the wonder, the greetings, the anticipation, and the farewells that define move-in day festivities. Also check out the Orientation 2016 social media wrap-up below to see how we kicked off a fresh year—with Paws, balloons, pooches, programming, and more. Will this be you next year?